This is the Skylar's brought to you by Dillanos Coffee Roasters. 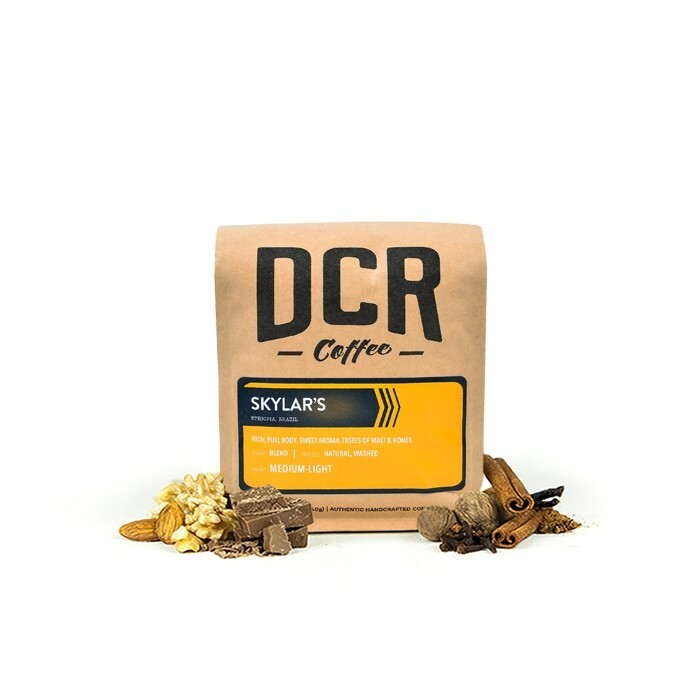 This diverse blend pairs the eccentric flavor characteristics of Dillanos' Costa Rican and Tanzanian coffees with the fullness of their Papua New Guinea. This cup is fantastically rich and full bodied, with notes of honey and malted chocolate. While I’ve loved other Dillanos coffees, this blend is unbalanced with a forward bitter flavor and a strangely sweet aftertaste. This has a very floral aftertaste that we did not care for. Also very bitter. I'm really enjoying Skylars Blend. The chocolate certainly comes through in a roasty way, with a faint finish of citrus. I don't know that my palate perceives this blend as "bright," but that may also be the fact that I'm still experimenting with my grind. No matter; I'd buy this again down the road. This coffee is very easy to drink--subtle bitterness and super light notes of citrus. I would recommend for the beginner coffee drinker. Just did like this blend. It wasn't balanced or bright. Good for a dark roast drinker that wanted to expand palate. I loved the aroma of this coffee. The only downfall for me was the almost burnt flavor I tasted. The floral and citrus notes were a pleasant change of pace from the coffees I tend to go for, but the roast was a bit bright and fairly acidic for my tastes. I might be interested in a bolder coffee with some of these flavors every once in a while. Tasted too bitter for me. I normally don't like fruity coffee, but this was surprisingly good. The first few cups came out well but this coffee lost flavor very quickly. Overall balanced flavor with nice chocolate taste but citrus notes didn't last long and bitterness became more apparent. I didn't love it, to be honest. It tasted a bit burnt when I prepared it using the same coffee pot I use to make Quill's coffee (which ends up being delicious). This coffee tastes better than my previous. However, it has a burnt taste that I'm not sure I love. This coffee was good for me but not great. My family loved the creamy body and chocolate notes. I brewed this with four different brewers and never really detected the brightness or the citrus. It was classified as a light roast but some of the beans looked to have a little oil on them and I believe it was a Full City. Not a bad batch at all, just not my favorite. Excellent!...for a light roast. I've enjoyed it. Need to try dark now...my favorite. This isn't bad...I don't consider it that great either. A bit acidic, and a very light blend as well. Not one of my favorites. A good cup of coffee, definitely balanced. Chocolate and orange notes. I was not to fond of the light roast with the honey taste. I felt that know matter how strong I brewed it it still tasted weak. I prefer a stronger roast. The honey gave it a slightly weird after taste to me. Overall if you like light roasts it is good, but I do not. Good, easy drinking light roast for a summer day. Citrus and floral notes that are not overpowering when drank black. All subtle flavors here. Probably the best light roast coffee I've ever had. I don't usually enjoy light roast, but for a light roast this was quite good. Good but a little too bright/acidic. Loved this coffee. Nice balance overall. Id say its mellow, and light overall. Nice first choice. Did not care for the aroma or taste. Prefer a nutty taste. We liked this! I think in general we'd prefer a smoother cup with a sweeter profile, but this was pretty good. I really liked this one. It was exactly what I was looking for. Not too heavy and very tasty. It's good. But it doesn't have staying power. Just ground and just brewed, it's a 4. But let the grind sit till later, or let the cup cool too far, and much of the flavor has changed. Coffee is great, super smooth. Packaging was difficult to open, ended up ripping the bag, and the seal stick thingy fell off in the process. Sour/bitter aftertast, and a thin bodyAlso didn't like the light roast. Already stated medium roast is preferred. I loved the sweet and citrusy combination ! Horrible. Do not order from this company. The customer service is awful. This was a really great coffee - especially for our first one. It wasn't too bitter. It's a nice lighter coffee for days you aren't wanting a heavier darker roast. My general preference leans more towards medium-dark, but we really enjoyed this one and would purchase again. I did not enjoy this coffee. I'm not sure if it was too acidic or what, but it just tasted bitter to me. Great blend, lighter compared to other blends from Dillanos which was a great change of pace. this was a great selection. I recommend anyone who would want slight chocolate undertones in a light roast level. We usually have good luck with Dillanos, and this was an expected winner. Light but still exhibited a very earthy, deep feeling. Very well balanced. Caffeine level was mild.